College can have an incredible impact on a person’s life. 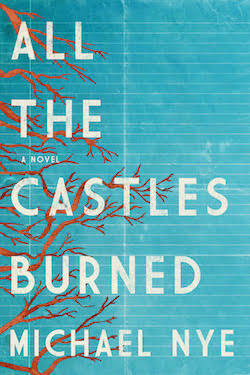 For English alumnus Michael Nye (BA, 2000), parts of his experience as a student at The Ohio State University helped shape his debut novel, All the Castles Burned, which was published on Feb. 13. Set in the early 1990s, the story follows the friendship of Owen Webb and Carson Bly, two boys united by their love for basketball despite their drastically different socioeconomic statuses. However, their relationship becomes strained as Owen deals with his father’s unexpected arrest and Carson’s behavior becomes more erratic and violent. The book addresses a mixture of different themes, including class in society, privilege, violence and male friendship. Nye said that his education in the Department of English’s creative writing program helped him to write about the large variety of topics. Despite having a lifelong passion for good literature, Nye didn’t choose to be an English major from the get-go. When he started his undergraduate career, he wasn’t sure what degree he wanted to pursue, but he knew Ohio State would give him the chance to explore myriad options. Much of Nye’s work while at Ohio State focused on contemporary literature and short stories. The greatest challenge with writing short stories was being able to condense an assortment of themes and emotions into 20 pages, Nye said. He made sure to take classes every quarter where he could challenge himself, hone his skills and get invaluable feedback from his classmates and professors. By the time he graduated, Nye knew that he wanted to be an author. He had his eyes set on attending graduate school, but his professors told him to ‘go live in the world’ for a little while. Nye found himself in Boston as a portfolio analyst and researcher for Putnam Investments, where he was able to use his solid writing and oral communication skills. Although his passion for creative writing had not waned, Nye found it difficult to set aside time to write. Nye earned his MFA from the University of Missouri-St. Louis in 2006. Six years later, he published his first short story collection Strategies Against Extinction, but the goal of becoming a novelist was still on the top of his list. In early 2017, Nye’s agent sold All the Castles Burned to Turner Publishing, setting in motion the process of making Nye’s first novel come to life. Despite all the horror stories he had heard from fellow authors, Nye was surprised to find the publishing process to be a delightful experience. He felt like he had a dependable team of people around him helping to put the book together. Now that his novel has hit the shelves, Nye is most excited about finding new readers.